Former MiGOP Comm Director Freak Out? Medical attention required, as stroke victim cognitively impaired beyond reason. Perhaps Bill Nowling, formerly the Director of Communication for the Michigan Republican Party has popped a vessel. 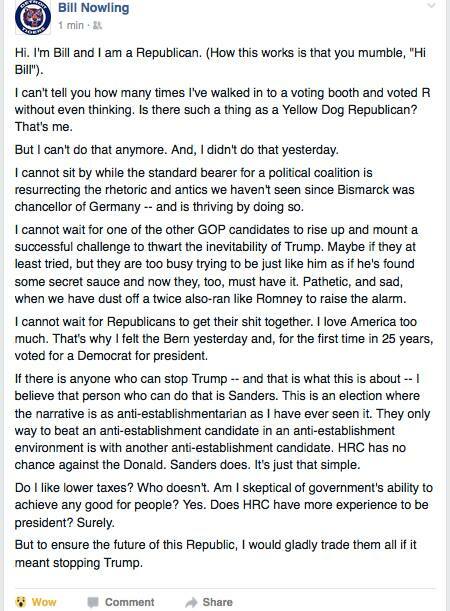 Also making comparisons of Trump to Hitler, he calls himself a yellow dog republican. Unless this is an elaborate prank, this is a perfect example of the establishment self destruct that is going on right now. As a former apparatchik of the MiGOP, Nowling once used his communications skills to target liberals and their antics. Well, after last night either Cucks unify behind Trump or, the Party dies. It's a Win-Win for many of us like-minded thinkers. Congratulatory to the bought off cuck broad in the 80th and whatever the hell it is in the 82nd. Congratulations to Trump, who brought out numbers of voters this state hasn't seen since 1972? Not so much as a peep. Apparently Bill is a member of RA--republicans anonymous. Hey, I watched Ronna junior on the news yesterday and sworn she had teleprompters because her answers were so pat and disingenuous--but hey--maybe she too is a member of RA. Her Uncle Mitt is the grand poohpa on RA dochaknow. You woulda thought that Kelly would have asked her about her uncle's Thurs. speech and here is why Trump and me have problems with Kelly. "...rhetoric and antics we haven't seen since Bismarck..."
Otto Eduard Leopold, Prince of Bismarck, Duke of Lauenburg was the very inventor of today's establishment political playbook. C'mon man, this unhinged, yesterday's news Bill Nowling guy is a case example of Cuckservatism. Told you before this election is about globalists vs. nationalists. Trump's border wall alone triggers the hell out of self-loathing skid marks on the underwear of life types like Bill. The only thing missing to cover all pillars of his hilarious cuck meltdown rant is he didn't actually write a sentence on muh israel. Ah yes, I'm already enjoying the new paradigm unfolding in politics. Icing on the cake will be having 8 years of a hot FLOTUS unabashedly proud of America, being a woman and her husband, in comparison to the last three barkers.